1) After the first push the stack gets updated. But after the second push, it seems like the first push is undone and there is only one qword pushed on the stack. Could someone explain what is going on? 2) The instruction is pushd 0x00. But I see it is only pushing qwords. In 64 bit, can you push only qwords or can you push other amounts? If your code is 32-bit then all pushes can be 2 bytes or 4 bytes. In 64-bit mode all pushes can be either 2 bytes or 8 bytes (never 4 bytes). So I guess your code is 32-bit, FDBG is displaying the stack as 64-bit values, and each push is 4 bytes. What is all that extra stuff? Sorry for my confusion. If the push is only 4 bytes then all the values shift by half in the 64 bit display. Ideally FDBG should display 32 bit values and then each push would simply move everything down one slot, instead of what you see where it moves everything horizontally and then down. If you follow the path of the 32 bit value "FFED62CA" you can see it go from one side the the other side and move down one slot for each two pushes. Can you change FDBG to show 32 bit values? I don't know if it's possible to change FDBG to do that. Are there other debuggers for Linux? Could you recommend some? gdb is pretty much the "standard" though I dislike it. You guys will really like it. 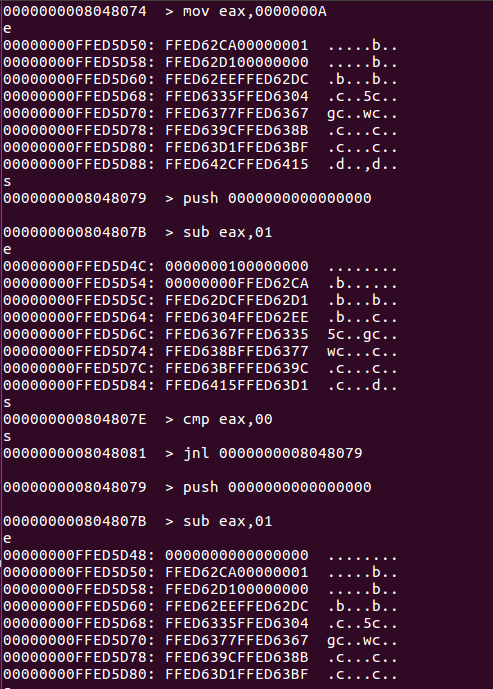 You need to first install GDB version 7.7+ (8 works too) and then you run that script and then run gdb -q somebinary. 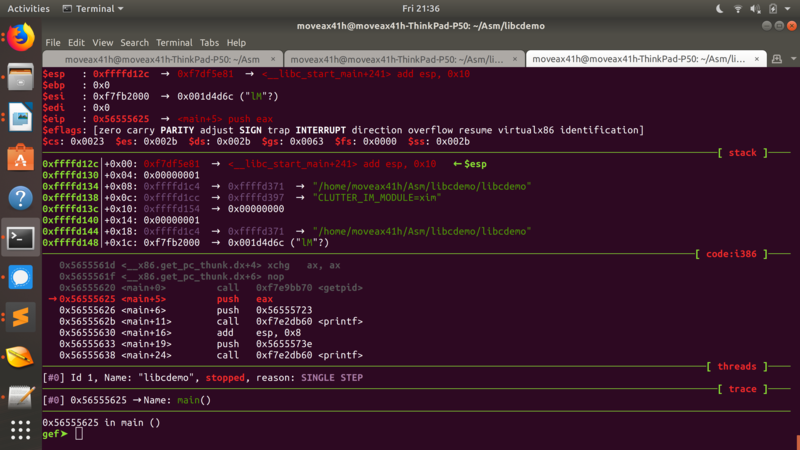 This is great for an assembly programmer on Linux. See screenshot attached to this post.